Summary: Hotel & Leisure Advisors performed a survey of outdoor waterparks in the United States to determine which parts of the country had the most outdoor waterparks and the division between private versus municipal waterparks. Our survey indicated there are a total of 330 outdoor waterparks in the United States including 103 municipal properties and 227 privately owned waterparks. We have defined an outdoor waterpark as a property which contains three or more large water slides in addition to other water features. The Midwest contains the highest number of outdoor waterparks in the United States as well as the highest number of municipal properties. A waterpark is a type of amusement park that features water play areas such as water slides, splash pads, wave pool, lazy rivers, and swimming pools. Outdoor waterparks are generally seasonal and are highly dependent on the weather. Although outdoor waterparks have been around for the past several decades, there is no industry wide standard as to what qualifies as an outdoor waterpark. Is a pool with one slide a waterpark? Hotel & Leisure Advisors used a simple criterion to highlight the number of waterparks in the United States. The most common element in any outdoor waterpark is a slide. 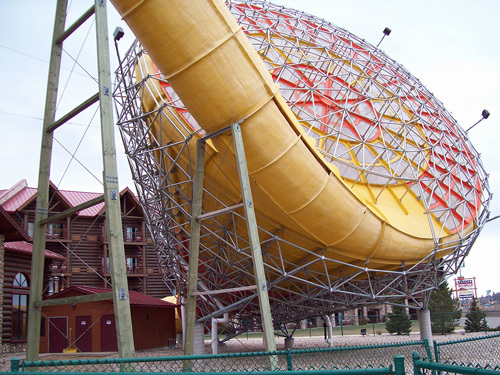 For the purposes of our analyses, we have only included outdoor waterparks that have three or more large slides. The 2009 survey by Hotel & Leisure Advisors identifies that there are 330 outdoor waterparks located in United States. Among these 227 or 69% are privately owned and 103 or 31% are municipally owned. There are numerous additional outdoor aquatic centers located throughout the United States, many of which are municipally owned, which are not included in our statistics as they are too small to be considered as a waterpark. 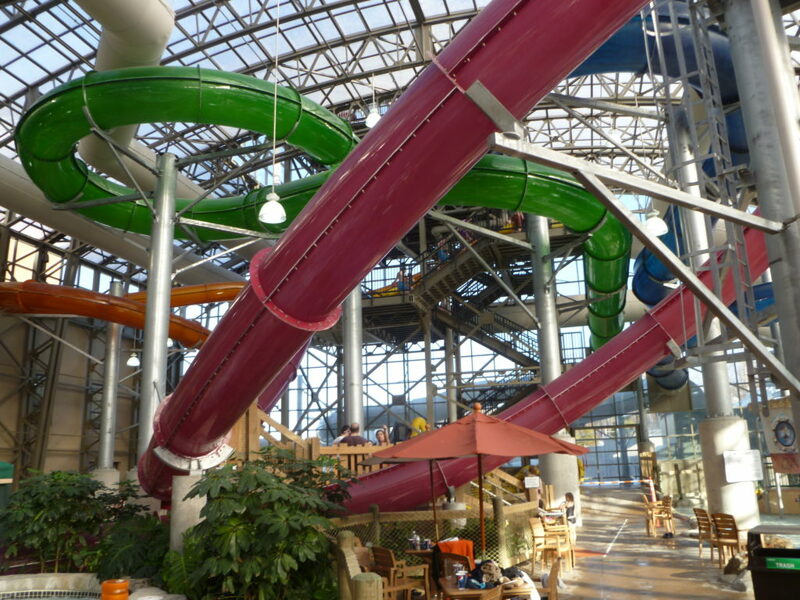 This study excludes the over 130 open indoor waterparks which we have written about in separate articles. Outdoor Waterparks can generally be classified in two major categories: Municipal Waterparks and Private Waterparks. Municipal Waterparks: These are typically owned by the city or county in which they are located and are built to benefit the local community. These waterparks are built with taxpayer money and are generally operated as not-for-profit facilities. These waterparks charge prices lower than private waterparks and provide discounts to taxpayers who live within the municipalities. Typically, the municipal waterpark is not built as an additional revenue source for the local government. Any profit from the waterpark is generally re-invested to expand or maintain the waterpark. As such, they do not have the financial pressures faced by private waterparks. Municipal waterparks typically offer a large swimming pool with fewer waterslides. However, there are larger municipal facilities that also offer a lazy river and wave pool. Municipal waterparks generally do not compete with other private attractions and have a low marketing budget. Private Waterparks: These waterparks are built to generate a profit for the ownership company. These waterparks are typically located in major metropolitan areas or in popular tourist destinations. Admissions at these waterparks are priced higher than municipal waterparks as they provide better quality rides and attractions, and their goal is to earn a rate of return for the investors. Unlike some municipal waterparks, private waterparks generally expand every few years, adding or replacing rides in order to encourage guests to visit more frequently. Private waterparks compete with other recreation attractions in the local community or region and have a higher marketing budget. Unlike municipal facilities, private waterparks also make money from retail shops and concession stands within the waterpark. There are 330 outdoor waterparks in the United States with three or more large water slides. This includes 103 municipal facilities and 227 private outdoor waterparks. The number of slides at these facilities range from three to over forty slides. 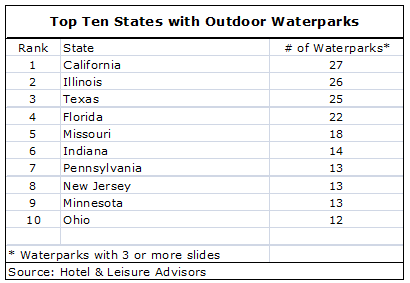 The following table highlights the top 10 states with outdoor waterparks. 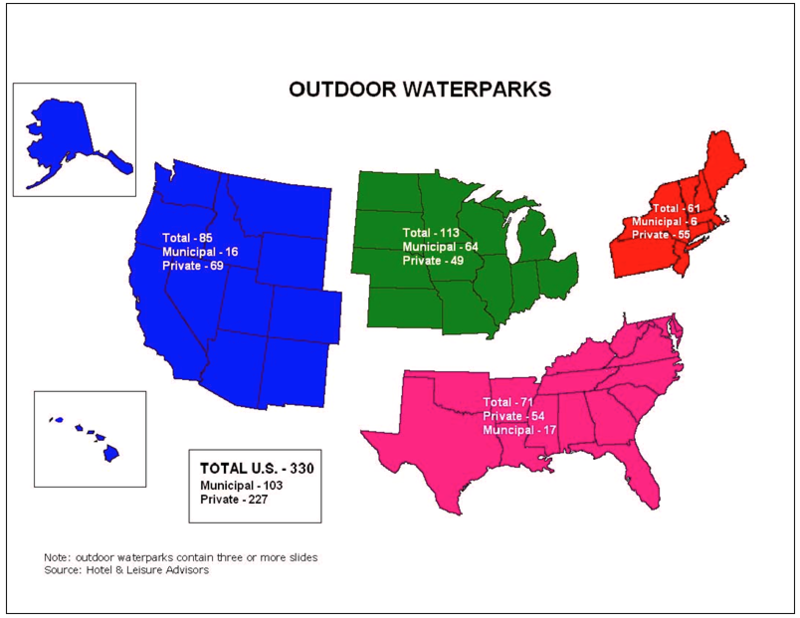 The following table indicates there is one outdoor waterpark for every 950,000 people in the country. The outdoor waterpark supply analysis has been segmented in the following geographic regions. The table indicates that the Midwest has the highest number of waterparks as well as the highest number of municipal waterparks. In the Midwest there is more competition between the privately owned outdoor waterparks and their municipally owned counterparts as customers can choose which facility they prefer to visit. The larger privately owned facility is more expensive to visit. Because municipally owned properties have a lower cost basis, as they are built with taxpayer funds, the privately owned facilities have to offer higher levels of entertainment value to attract sufficient customers. The Southern states offer the greatest number of people per waterpark indicating they have the greatest amount of potential development opportunities. However, the largest outdoor waterparks both by attendance and by size are located in the Orlando region. Waterpark Growth: There continues to be substantial interest in developing both municipally owned and privately owned outdoor waterparks due to a number of factors. These include higher levels of disposable income, less interest in swimming in natural ocean and freshwater bodies of water, greater interest in thrill rides which can exist in waterparks, and strong marketing efforts by the waterpark industry. However, the recession of 2009 has caused delays for numerous projects. The World Waterpark Association estimates there were approximately 80,000,000 visits to indoor and outdoor waterparks in 2008. The vast majority of waterparks achieve attendance figures between 50,000 and 500,000 people annually. With the strong success of new facilities such as Aquatica in Orlando, we project continued growth of privately owned waterparks as both expansions of existing facilities and new developments. We additionally project continued growth in municipally owned facilities as they typically are more popular and can pay their own way, versus the municipally owned swimming pool which typically loses money. We project the growth will occur in both the Northern and Southern states as the primary season for both locations is still the summer months. This article was originally published by Aquatics International.